Punchy flavours and a variety of textures make this a great summer salad. 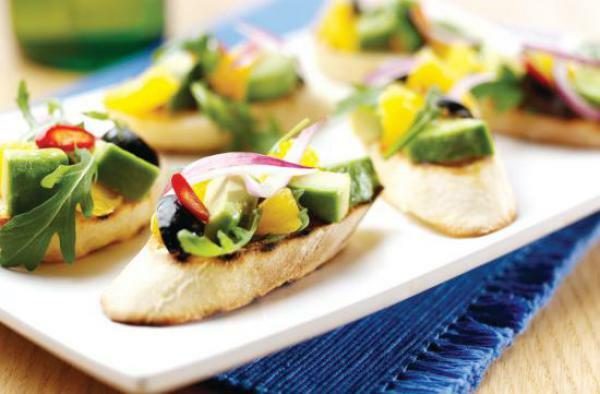 Serve on bruschettas for a delicious summer canapé. Halve, peel and de-stone the avocado and cut into slices, or cube if making bruschettas. Grate the zest from one of the oranges and reserve. Cut away the peel and pith from the oranges and cut into bite size segments. Squeeze any juice from the discarded orange pith into a small bowl. Slice the onion into thin strips. Mix together the cordial, olive oil, lemon juice, any reserved orange juice and zest and the de-seeded, sliced chilli. Toss the avocado, orange and onion into the dressing, quarter the olives and add to the rocket. Slice the ciabatta, brush with a little olive oil, griddle until marked on each side. Either pile the salad onto the individual toasts and serve as canapés or serve the salad with the griddled toasts.